Botanical gardens are institutions which hold documented collections of living plants for the purposes of scientific research, conservation, display and education. They grow a wide variety of plants from ferns, conifers and flowering plants and those that specialize in trees are referred to as arboretums. As well as educating botanists and horticulturalists they may also serve to entertain and educate the public by allowing us to visit, like that of Kew Gardens nr Richmond in Surrey. However not all botanical gardens are open to the public. Botanic Gardens have a long history in the UK, beginning with the foundation of the Oxford Botanic Garden in 1621 and the Apothecaries’ Garden (Chelsea Physic Garden) in 1673. However, in Europe the earliest roots of such gardens were in Italy, usually connected with the universities, the first formal Botanic Garden was founded in Pisa in 1543. The early botanic gardens were designed as medicinal teaching collections. Over the centuries the European botanic garden became increasingly tied in with the expanding empires and colonial exploration, and seeds and plants were sent back to the gardens from all over the world. From the late 18th century onwards botanical gardens began sending plant-collecting expeditions to various parts of the world and published their findings. These voyages routinely included botanists and scientific work studied how these exotic plants might be adapted to grow in the gardens locale, how to classify them, how to propagate rare or endangered species and such establishments as Kew would also continuously publish journals and more recently databases of their finds. Botanical gardens also have educational projects which range from introductions to plants that thrive in different environments to practical advice for the home gardener. Many also have plant shops, selling flower, herb, and vegetable seedlings suitable for transplantation. Some gardens also have plant breeding programmes and introduce new plants to the horticultural trade. Botanists and horticulturalists tend the flora and maintain the garden's library and herbarium of dried and documented plant material within a Botanic Garden. The most well known UK botanic garden is Kew Gardens, London which was first established as a botanic garden in 1759, when Princess Augusta and Lord Bute, employed William Aiton as the gardener. The Physic or Exotic Garden is the direct ancestor of today's Kew and it is now accepted that 1759 is the foundation of the Royal Botanic Gardens, Kew, and in 2009 they celebrated their 250th anniversary. In William Aiton's time it covered an area of about 10 acres and was devoted to medicinal plantings, and the partnership of Aiton and Princess Augusta it continued to grow and flourish, but it was not until after her death in 1772 that it developed into the international significance it is known as today. See History of Kew Gardens for a more detailed view of Kew. If you want to visit Kew then see our location guide, Kew Gardens for details of opening times, what you might see and more. Kew Gardens is one of over 800 participating botanical gardens in the database of the Botanic Gardens Conservation International website. The BGCI is a conservation charity based in England and is a membership organisation with over 800 Botanic Gardens spread throughout 120 countries. 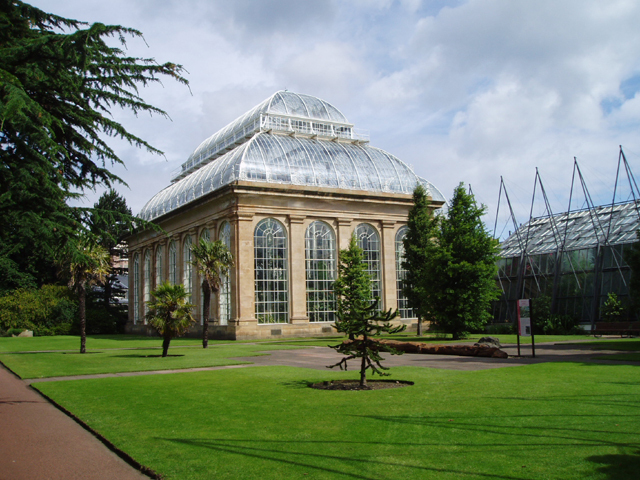 It was founded in 1987 and the Royal Botanic Gardens , Kew and the Royal Botanic Garden, Edinburgh are it's two key supporters. On their website you can find out about them, you can search for a garden by country - there are currently 2,811 gardens in the database of which 116 are in the UK. You can also do a plant search of the 575,000 records they have in their database compiled from lists of living collections at the worlds botanic gardens. Amongst it's resource centre heading you can also find links to websites that provide plant images. We also have a list of Botanical Gardens in the UK where to you find details of where they are and their public access details. Botanic Gardens - What are they ? Further Information - for books on garden, flower and plant photography.